Rabbi Arye Leib Frumkin was born in Kelme in 1845 the youngest child of Rabbi Shmuel Kelmer and Fruma Braude. He married at the age of eighteen to Sheina the daughter of Aharon Hodes, and moved to Pickeln. In Pickeln he took on many of the duties of the local Rabbi , who was confined to his sickbed, and the young Reb Arye Leib delighted the local community with brilliant sermons, and taldmudic discourses. In 1866, Reb Arye Leb's father Reb Shmuel Kelmer, feeling that his end was near made his second and final pilgrimige to Jerusalem, but bade his son not to follow him, because of the hardships of life at that time in the holy land. In both this trip and Reb Shmuel's previous trip, father and son had kept in touch, and many of the letters written by father to son, have been preserved and can be found in the archives of the National Library in Jerusalem. Added to the fascination and beauty of many of these letters, their historical importance in documenting the life style of Reb Shmuel and the community in Jerusalem, has led to the publishing of a study of the times though the text of these letters, by Professor Immanuel Etkes - "Lita BeYerushalim" - (in Hebrew Yad Iztchak Ben-Zvi). The Young Arye Leib's responses have not survived, but from his father's replies, we can see that Arye Leib's attempts at responsa, excited his father to showing these to the sages in Jerusalem, who foresaw a great future for the young man. After the death of his father, Arye Leib, felt an urgent desire to visit his father's grave. In order not to have to take charity to finance his trip, he worked for two years in Odessa as a bookeeper, there making the acquaintance of many of the future Zionist leaders, including Y.L. Pinsker, M. L. Lillenblum. He finally arrived in Jerusalem in 1871, and resided at the home of Rabbi Zev Asia Levinzon, the Doctor to the Ashekenazi community, and from there he was able to investigate the holy places, and was moved by the desolation of the graves on the Mount of Olives. He was encouraged by the sages in Jerusalem to research the history of the great Rabbis of Jerusalem, and began his monumental work - "Toldot Chachmei Yerushalayim". At that time he was also persuaded to publish "Masa Ibn Shmuel" - Travels of the son of Shmuel" an open letter origionally intended for the Odessa community. After over a year in Jerusalem, he returned home, and in 1874, the first part of "Toldot Chachmei Yerushalayim", was published in Vilna, and he travelled through Russia and Poland to publicise his book, but suffered considerable expenses in this venture, and was even arrested in Warsaw, when found to be carrying a Turkish Passport. He opened a book shop without much success and finally returned to his family in Pikeln and opened a small Yeshiva and studied for his Rabbinical Smicha, and was ordained by several of the leading Rabbis of the time including Rabbi Yitchok Elchonon Spector, of Kovna. He soon was appointed Rabbi in Alexot, across the River Nieman from Kovna, where he was treated with great respect and earned a fine reputation, particularly after resolving a lengthy and difficult dispute between two local traders, which had not been settled by other sages of the time. During this time he wrote "Ahavat Yisroel" a treatise on saintly behaviour. But the peaceful times did not last for long, and family illness and then the anti Jewish riots in Russia in 1882, troubled him very much, and he joined the leaders and Rabbis in lengthy discussions under the guidance of Rabbi Yitzchok Elchonon, as to how to deal with the approaching evil. Rabbi Frumkin was one of the few to support emigration to Israel rather than America, and he embarked upon a propaganda mission amongst the Jews of Germany to promote the idea. While in Berlin he made contact with an orthodox wealthy Jew, Emil Lachman, and suceeded in convincing him to invest large sums of money in the revival of Jewish life in Israel. Rabbi Frumkin took upon himself to travel to Palestine, to buy land on Lachman's behalf and arrange for it's cultivation, and in return Lachman agreed to support the Yeshiva, that Rabbi Frumkin would establish. He was also received in Frankfurt by the aging patriach Shimon Wolf Rothschild, who pledged the support of the Rothschild family. In 1883, he arrived in Palestine, and after investigating several possible sites, he finally joined with the settlers of Petach Tikva. However, a serious attack of malaria forced him to return home to Lithuania, with his mind set on return. On the eve off Pesach 1884, the River Neiman flooded, destroying many houses in Alkesot, including Rabbi Arye Leib's and seeing this as a further sign, he resigned his postion as Rabbi, declining other offers, and friends' pleas, and embarked on the journey to Palestine, with his wife and four of his six children (the two older girls remained with his mother in Russia). The sea voyage was treachorous, but they finally landed safely in Jaffa on the eve of Rosh Hashana. The family rented a home in Yehudia, and he walked many miles, daily to work the land in Petach Tikva, to ease the daily travel he learned to ride a horse, but decided eventually that the only solution was to build a house in Petach Tikva. The other settlers were against this move, as the first Petach Tikva settlement had been destroyed by malaria, and Rabbi Frumkin was boycotted, but determined he and his family moved to Petach Tikva ,despite the dangers, and proved the viability of survival. His determination showed the way, and he was slowly joined by others and the settlement began to flourish. He toiled for the new settlement and started a Talmud Torah, but trouble was never far away, and the costs of maintaining the orchards and vineyards till they became profitable, caused a rift between Frumkin and his benefactor Lachman. Lachman, even sent emmissaries to invetstigate the way Rabbi Arye Leib was running his affairs and instituted a court case against him, for mismanagement. Because of false evidence given by an arab, people were led to believe that Rabbi Frumkin was responsible for the death of two arabs, during the excavation of a well, and he was forced to live in hiding in Jerusalem for six months. 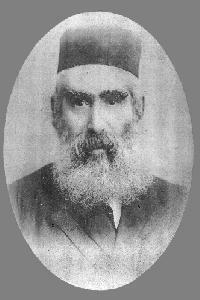 Rabbi Frumkin, was helped by his son-in-law Benjamin Yahalom to get to Europe, and ended up in London in 1894, and although he attempted to hide the fact that he was a Rabbi, and started to learn the tailoring trade, his secret soon became known, through fellow countrymen arriving from Lithuania. He refused to take another rabbinical postion, but he once again began to teach and deliver talmudical discourses. His wife Sheina, and family joined him and the family opened the later well known kosher wine shop - L. Frumkin, in Commercial Road, from which they were able to make a good and honourable living. Rabbi Arye Leib continued with his communal activities and studies and gathered further material for his "Toldot Chachmei Yerushalayim, and "Siddur Rav Amram Gaon". In 1911 he left the business in the hands of his children and returned with Sheina to Palestine. He spent some time in Jerusalem and published "Siddur Rav Amram Gaon", and then returned to Petach Tikva devoting time to many communal and charitable endeavours. He died in Petach Tikva in 1916 (Erev Shabbat 8th Sivan 5676), and although his dying wish was to be buried in Jerusalem, this proved impossible and he was laid to rest in Petach Tikva. His wife Sheina outlived him and died in Petach Tikva in 1929.